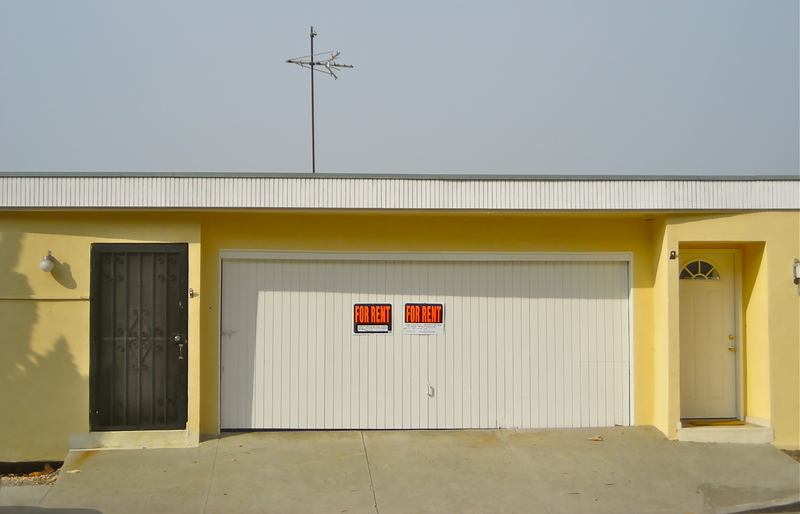 Coastal homes, Playa del Rey. Once upon a time, all of California’s beach communities were rustic bohemian enclaves. As the earth spun eastward, the Left Coast served as a natural collection point for drifters, hermits, and assorted characters (see Steinbeck’s “Cannery Row”) who fell through the cracks from all over the country. “Beachcombers” was the catchall euphemism for these beatnik-Americans who migrated to the margins of the urban grid and found solace in the littoral zone that was just beyond the reach of permanent pavement. Surfers too were originally a form of beatnik, as the Gidget stories subtly indicate. As a matter of fact, the first “Gidget” novel and film is really the watershed event where L.A.’s beach culture is concerned (see Kevin Starr). Before Gidget, surfers were considered social dropouts. After Gidget came the Beachboys, Jan & Dean, Frankie & Annette, and a championing of the beach lifestyle that captured popular imagination, begat skateboarding, and made Southern California the envy of the world. At the dawn of the Seventies, beach bohemia still had a place in SoCal culture. Consider the Rockford Files. Jim Rockford was a form of beach gypsy, a guy who lived in a simple trailer in a beach parking lot, liked to catch his dinner off the pier, and loathed the idea of dressing up or punching a clock, but nonetheless had a solid character and a heart of gold, along with a few undisclosed demons in his past. Recall the casualness of the cafes and the clientele in the vicinity of Rockford’s trailer, and keep in mind this is Malibu in the mid-70s, when it’s already synonymous with Hollywood glamour. Were the Rockford Files’ producers making a conscious effort to contrast the disappearing beachcombing culture with the new coast-oriented Southern California money culture, or did they just like the gimmick of a P.I. living in a trailer on the beach? “Fletch,” the novel upon which the Chevy Chase movie was based, was published in 1974, the same year that “The Rockford Files” debuted on network TV. “Fletch” portrays that same beach culture that existed on the margins of L.A., except instead of Malibu, it’s Santa Monica and Venice. Fletch is a more dubious character than Rockford, but he also turns out to be a likeable romantic who does the right thing when it counts. This is the essence of the Southern California beachcomber. By the end of the Seventies, with the onset of Southern California’s coastal real estate craze, the changing dynamics were undeniable. The Santa Monica beach stayed bohemian for a long time. 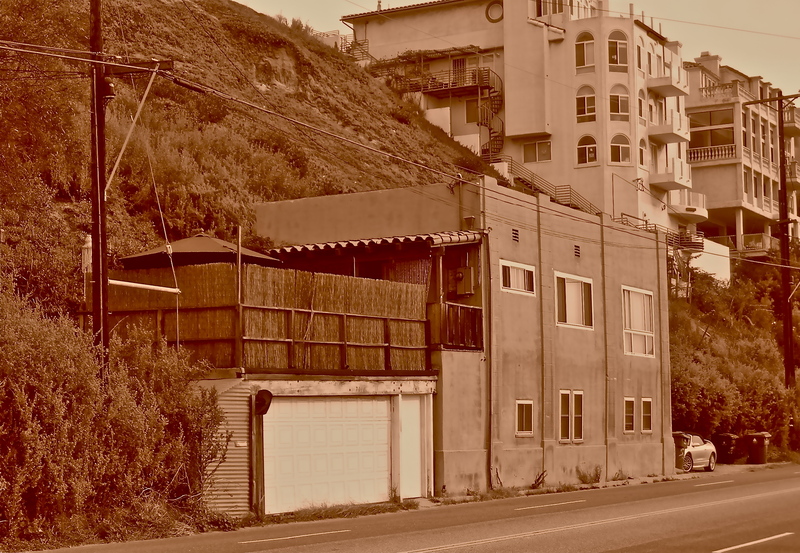 In fact, the patchwork of Santa Monica homes along the Pacific Coast Highway down below the bluffs retained an anarchy all its own well beyond the city’s gentrification craze, but that probably died with Troy Donahue and Margaux Hemingway. Venice Beach, which had long housed L.A.’s bohemian counterculture, held out significantly longer than Santa Monica, but it too finally succumbed to gentrification. I date the beginning of the end of freak Venice to L.A.’s 1984 Olympics. The sole remaining enclave of beach bum bohemia is Playa del Rey, but who knows for how much longer. The harbingers of irreversible change loom large everywhere. Well into the 1980s, the uncertain fate of Howard Hughes’ undeveloped land tracts, the moat-like Ballona Wetlands, and the presence of LA Intl. Airport all formed a cordon sanitaire that conspired to keep Playa Del Rey separate from LA’s late 20th Century coastal property boom. But now the Hughes property has been developed, as have the Ballona wetlands, and the airport seems to be embraced as a form of urban industrial cachet. 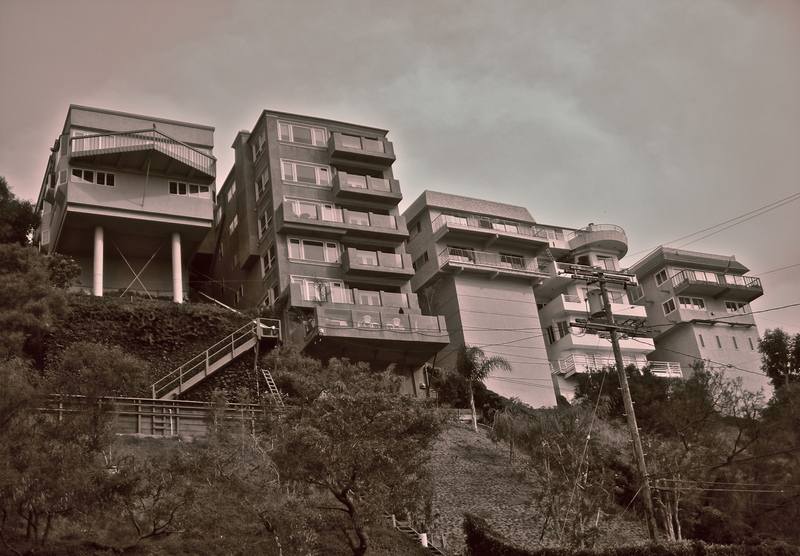 I can look up from the Jungle and still see the same funky cliffside houses jutting out on stilts that I saw in 1979. It was a look common to 70s LA wherever there were dusty brown hills. These houses seemed to suggest a period of time when living in the hills was the answer to all of LA’s problems, and no one was worried about earthquakes yet. 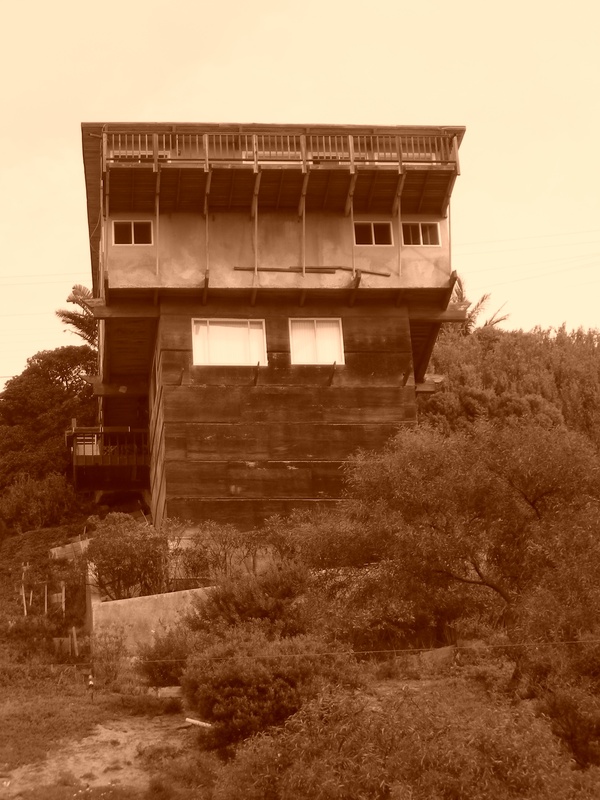 Thirty-odd years and several earthquakes later, the houses still stand on stilts, looking just as shabbily sturdy as ever. But now the hills have been filled in with the more modern version of the lavish house, ones that follow the contours of the landscape rather than boxes jutting out on brown wooden stilts. New money is finally homesteading the PDR beach. Perhaps the airport noise is what kept them away for so long. Indeed, whenever I revisit the area my attention is always shifted away by the passenger jets taking off every few minutes half a mile to the south. But you do quickly adapt. Soon, the roar of the jet engines is merely the unnoticed white noise of the Century of Progress. In an era when a refurbished downtown warehouse with exposed brick wall is the height of cosmopolitan esprit, airport noise is the Westside industrial ambience that gives your neighborhood street cred. One day soon, some photographer will successfully capture two figures clad in black turtleneck clinking chardonnay glasses on a well-appointed cliff-side deck with a 737 soaring skyward in the background out over the Pacific, and some sharp-eyed editor will place this photo on the cover of the right magazine at the right time. Then, Playa del Rey will have arrived, and it will mark the beginning of the end of L.A’s last bohemian beach enclave. Intersection where paint was spilled. 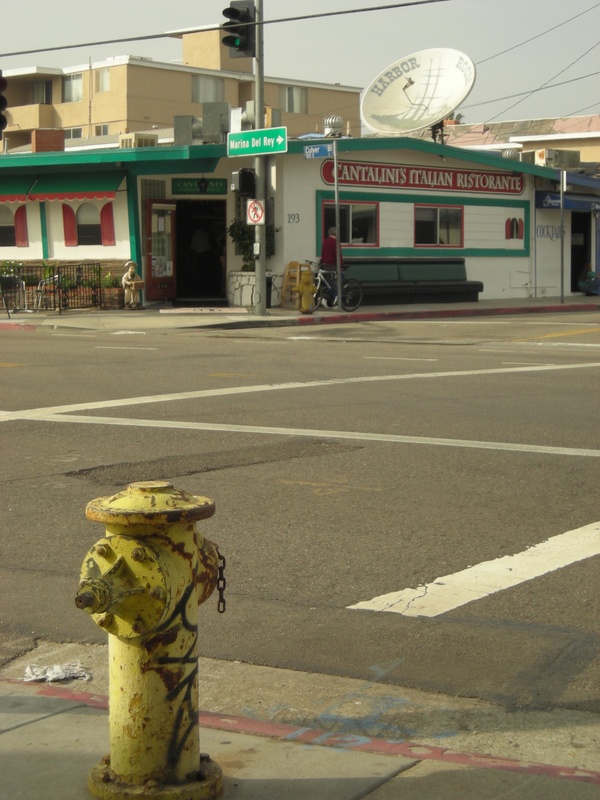 As of now, Playa Del Rey is still a place with rustic cafes, where six bucks and change gets you a plateful of eggs, potatoes, breakfast meat and toast at a joint where early-morning locals congregate and the big talk is of a 5-gallon bucket of white paint that just spilled in the intersection of Vista del Mar and Culver. The man telling the story knows by name the people whose truck tires have already rolled through the paint and tracked it across the intersection. There is the rustle of newspapers in this café, a TV tuned to the sports station in the background, and nothing digital in sight. The locals talk about the Lakers, about the salvaging of a Civil War submarine off the Atlantic coast somewhere, as well as a few other items of conversation that seem like they carry over from morning to morning. No one’s in a big hurry here. 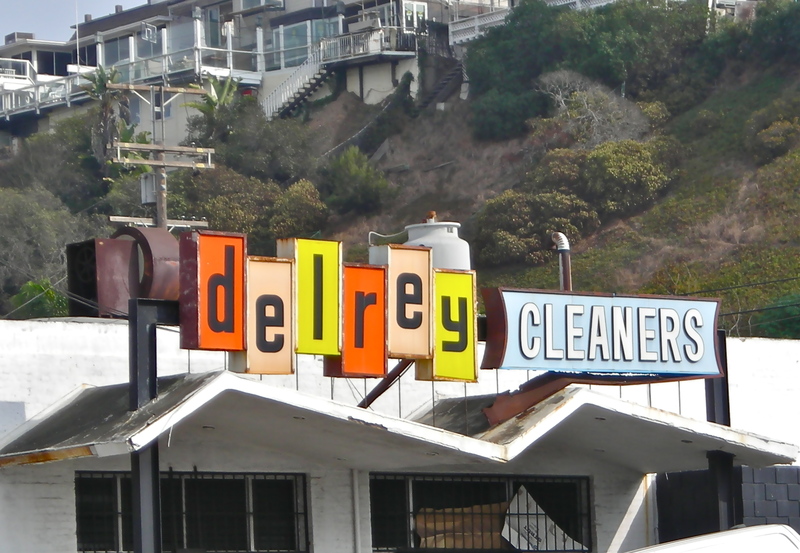 Del Rey Cleaners (already gone). 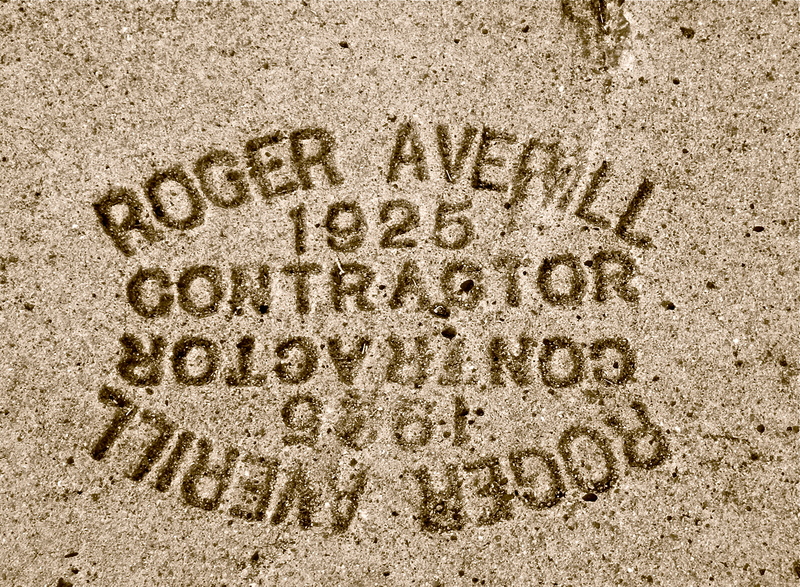 Sidewalk laid in 1925 and still in near mint condition. Across the street is another café, one that sells muffins and pastries instead of bacon and eggs. People are mostly getting their coffees to go, and if they’re in a hurry it’s not a stressed out hurry, it’s a glad to be alive and riding my bike or walking my dog along the beach hurry. There are usually two or three laptops open on the dozen or so tables, but even when the lines at the counter are long, nobody is rushing ahead to preemptively save a table by draping a jacket over a chair before standing in the coffee line, or any of those other aggressive big city moves. Civility still reigns in this narrow beach enclave. Enjoy it while it lasts. This is a fantastic piece Dave – makes me look forward to our upcoming trip more than ever. Thanks a lot, Mike. You’re basically a PDR local yourself now. Hi, I found you from your sister linking to you on Facebook. 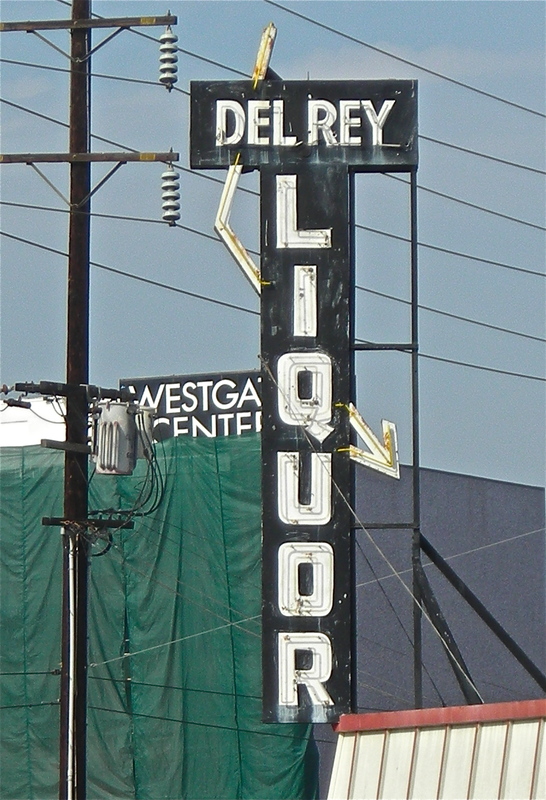 What a great, researched post about a huge part of the local, L.A. culture that’s rapidly disappearing. It’s sad that now when I think of Venice, I think of urban west-side hipsters, not the funky freaks that used to come to mind. I’m a native of SoCal myself, and thought you might be interested in seeing this vintage painting I have in my house, that I wrote about on my blog. After some digging, I found that it depicts a scene in Playa del Rey, in what looks to be the late ’60s/early ’70s. Hi Kelly, thanks for the kind words. 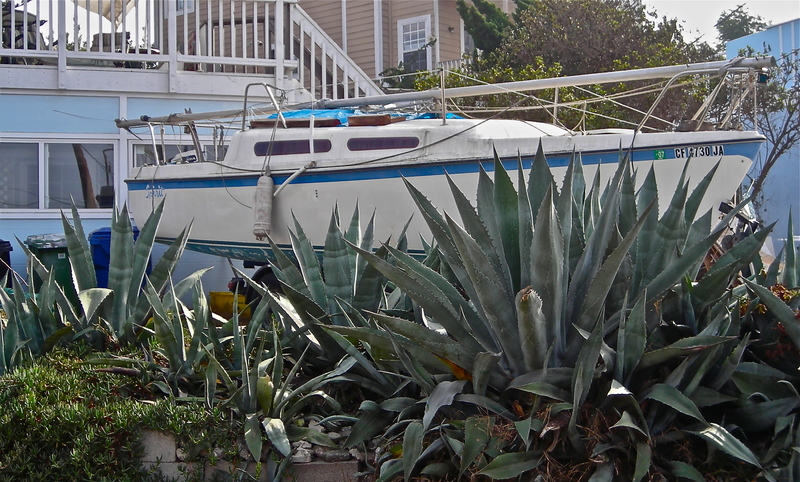 Yeah, that whole Abbot Kinney part of Venice has really become hipsterized, as have the canals, apparently. Neighborhoods always change as bohemian areas become trendy and gentrified and the artistic types have to move on to different neighborhoods, which in turn become trendy and gentrified, and so on. But the beaches are different, because even in L.A. they’ve long been as much a part of nature as a part of the urban grid. 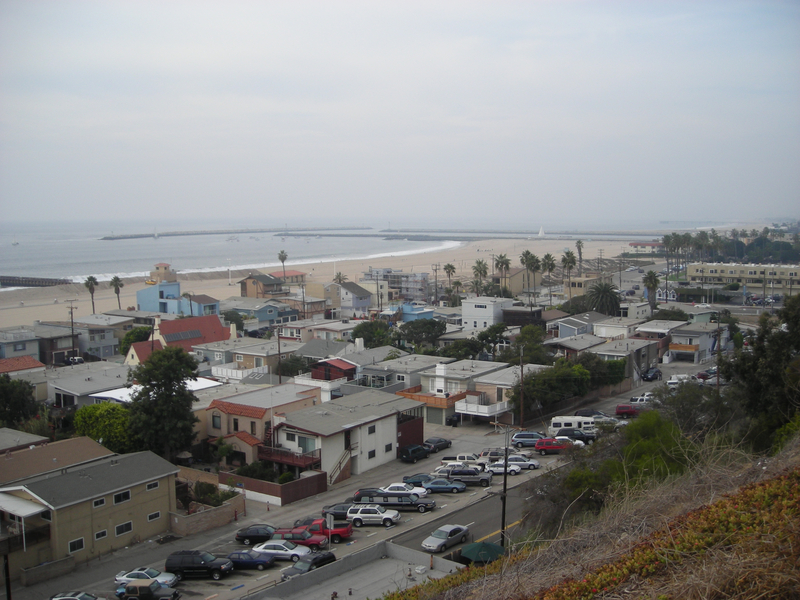 The dynamic in play since the time of Gidget (or before) is of forces of urbanization encroaching on longtime rural areas, which in this case is the coast rather than forests or canyons. Great score on that painting, and great sleuth work as well! (I left the same comment on your blog). 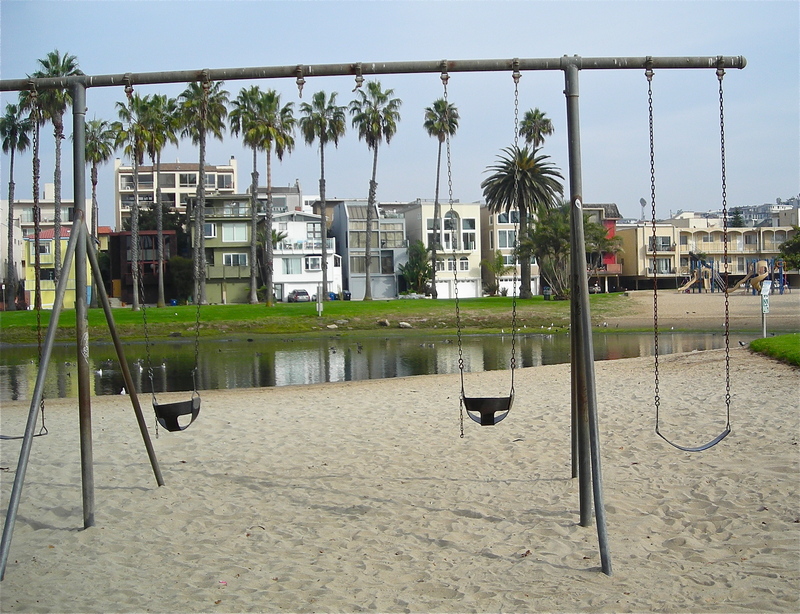 I recognize some tell-tale landmarks of Playa del Rey, namely the Del Rey Lagoon Park with the baseball diamond, as well as the Marina jetty in the background. Hey David – I really enjoyed your write up on PdR. I administrate a Facebook group that is dedicated to defending our town against a corporate developer who has some pretty grandiose designs for Culver Blvd. Basically he wants to make it into Playa Vista- big giant buildings, inadequate parking, etc. Anyway, I’d like to post a link to your article to the Facebook group, but wanted to ask permission first. 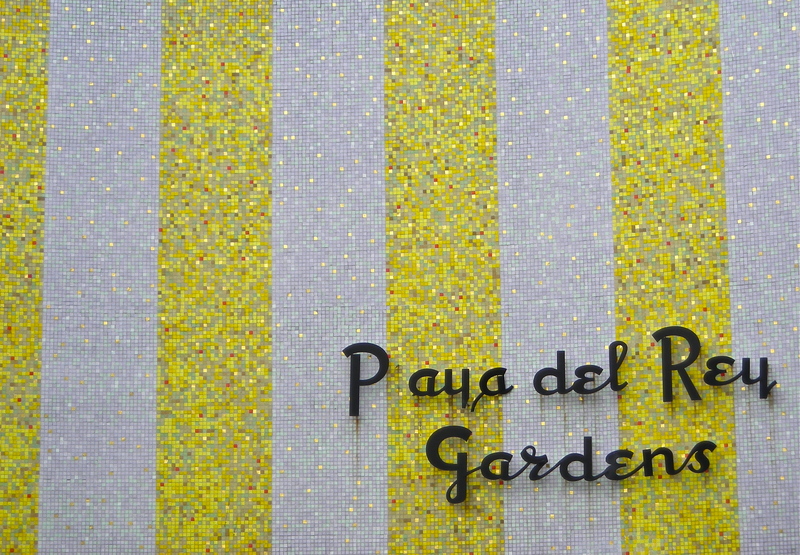 I think that the people who are interested in keeping Playa the way it is will enjoy the picture you’ve painted. Just hit me back if it’s cool. Hey Mike, I’m glad you enjoyed the post. Sorry to hear about the corporate developer. Sure, you can link this article to your group; maybe I can join it. Very nice post, David. I think you captured the feel of PDR perfectly. Thanks a lot, Chuck. Fifteen months after this posting, PDR still feels about the same. Nice essay, David. And nice photos too. Those of us who remember when the entire length of the Southern California coast was laid back are dwindling by the day. My aunt bought a house in Balboa Beach in the early 60s for almost nothing. Santa Monica, Santa Barbara, Santa Cruz all used to be run down in the nice gritty way. I guess freeways were the first stake in the heart for laid back beach culture. That’s what brought the wealthy into Orange County. And the Internet was the final death blow. The Avenues in SF still has a touch of the crumbling beach dynamics. So does Mission Beach in San Diego. I took my wife (Japanese) there once. It still has rundown cottages, rundown cafes serving bad cafe lattes, broken sidewalks. Surfer-dudes sitting around scratching themselves, I reminded her that the whole coast used to look like that. Beautiful piece about such an important subject – losing what makes LA unique to newbies trying to play the right song in their electronic car without spilling an $8 cup of coffee. I’ve been out of SoCal for almost 30 years, on the Central Coast. While living in Santa Cruz, I watched it wither away into a keeping up with the Joneses place, wall to wall traffic, billionaire yoga ladies shopping downtown. Monterey and surrounding areas have a beauty that remains kind of untouched, and really not much corporate development beyond agriculture. I sit and wait though, because Silicon Valley migrants are being priced out of Santa Cruz and they really have nowhere to go but here. We shall see. And there’s a pseudo town about five miles up 1 called Del Ray Oaks. Still haven’t changed the sign.